Happy Sunday to you all! I am popping in really quick to share with you my favorite holiday cards I've made for 2014. I also wanted to express my gratitude to my subscribers, both on You Tube and my blog. My blog doesn't get as much love and attention from me I feel, so that is one of the things I want to change in 2015!! Anyway!! Please enjoy my short video showcasing these cards! God Bless and Happy Holidays!! Hi all!! We are nearing to Christmas inch by inch! It has come so fast!! It is Lawnscaping's last challenge before Christmas, so I hope that where ever you are in the world - you feel the magic and the reason for the season! OK - so here is my card for this challenge! I used the fun set "Love you A Latte" from Lawn Fawn. I recently purchased the dies for this set as I didn't have them already - so I used them today. I stamped and die cut all my pieces. I added color using my Copic Markers and set them aside. 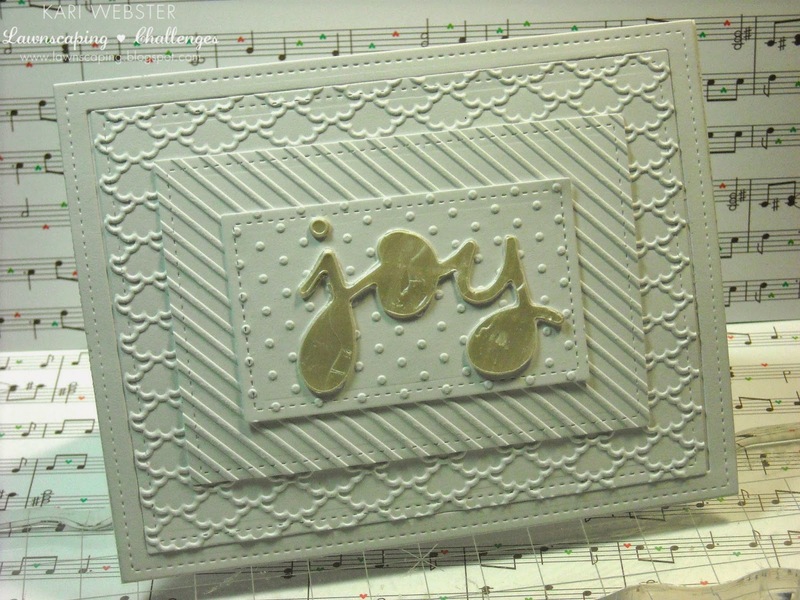 I die cut a tag from "Winter Gifts" and I stamped the border with VersaMark and heat embossed it with silver embossing powder. 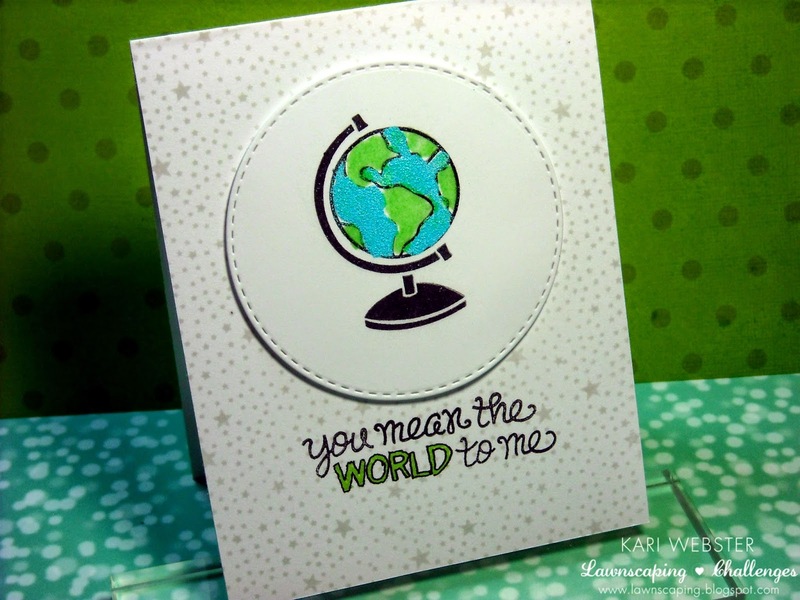 I wanted it to go nicely with my die cut sentiment from Simon Says Stamp. For a little extra "something", I took my R24 Copic Marker and colored in the border to make it pop and to give it a bit of contrast against my pattern paper. These little images from "Love you A Latte" are so cute, and the little faces just add to the cuteness. I added all my pieces onto my tag, as well as my die cut sentiment, and adhered it to my pattern paper from the Snow Day 6x6 from Lawn Fawn. 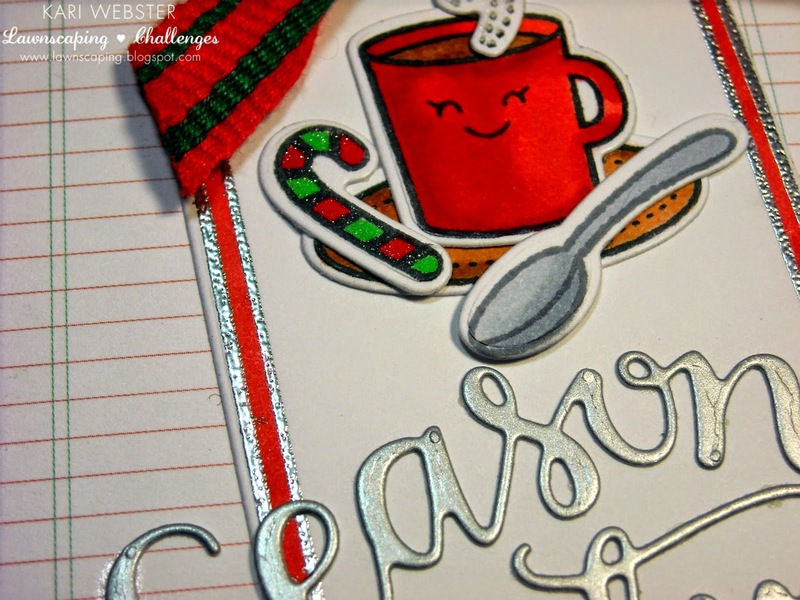 I liked the " you warm my heart" in the bottom right corner to this design - it paired nicely with the warm mug :) I added a bit of wink of stella to my candy cane and the "steam", and added a little bit of ribbon to the top of my tag. You can see a close up of the shimmer above. A big shout out of love to our sponsor - Lawn Fawn! They always bring out the creativity in their stamps and dies! Be sure to link up your project for your chance to win a $25 gift certificate!! Hi everyone!! Hope your Sunday and weekend has treated you well! I am back with another installment in my Holiday Card Series, and this is my final installment for this year! Today, I am making a small gift bag featuring Lawn Fawn's Goodie Bag Die! This die is awesome, and if you haven't picked it up yet, I highly recommend you add it to your die collection! As always I have linked my video tutorial for you :) And, if you are interested in any of the supplies I used, I have linked those below as well!! Thank you all for your support during my Holiday Card Series, and Happy Holidays!! Hello! It is time yet again for a new Lawnscaping Challenge!! 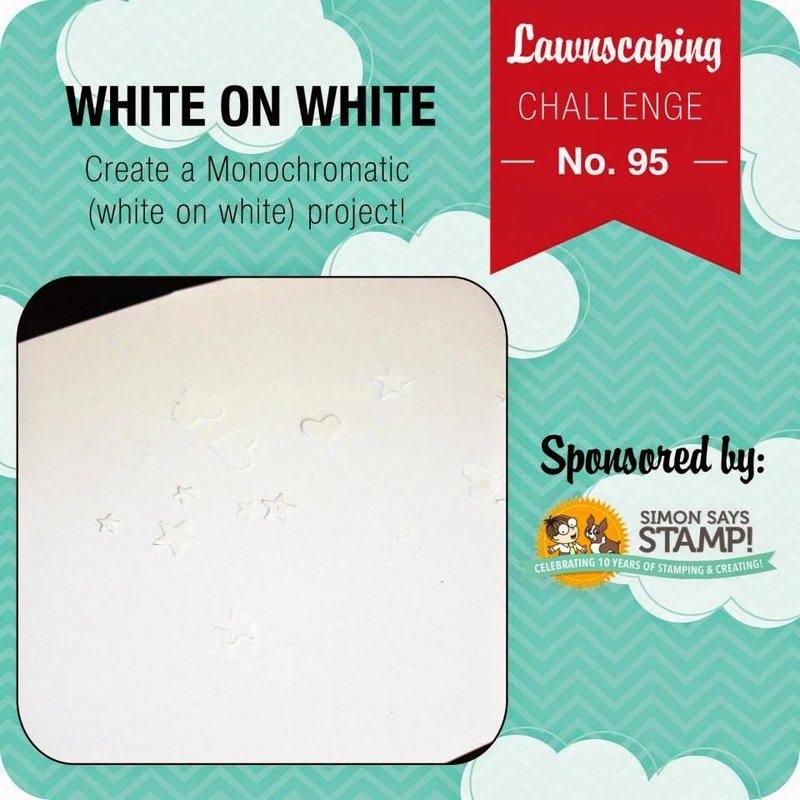 We are testing your Monochromatic skills by making a project featuring nothing but white!! This was sort of a challenge for me! But hopefully I have given you some ideas for inspiration for your project!! I thought to myself, how could I spruce up white! Give it different textures! So I die cut some white card stock using the Small Stitched Rectangles dies from Lawn Fawn, and I embossed each piece with a different embossing folder. 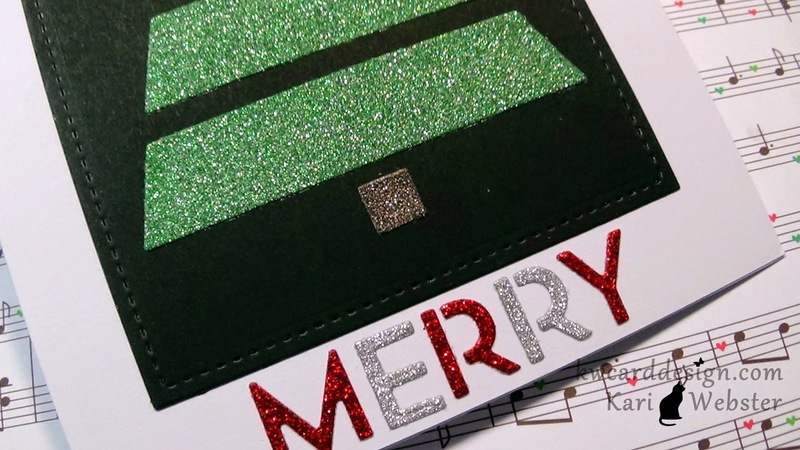 It totally transforms the white card stock! Then, a while back I was experimenting with dies and using the die cut negatives as a DIY stencil. I have a post on this very thing over at the Lawnscaping Blog here. White I was experimenting I did one with the Joy die from Lawn Fawn with my Ferro Mother of Pearl Modeling Creme, and I've been dying to use it ever since and this was the perfect project for it!! This challenge is sponsored by Simon Says Stamp. How awesome are they!?! So be sure to link up your project for your chance to win a $25 gift certificate! See you soon!! Hi all! I am popping in here really quickly to share with you that I posted my monthly crafty favorites for November. I have a video showcasing all of the products that I particularly loved this month, and explaining why I enjoyed them so much. I hope this video is helpful!! 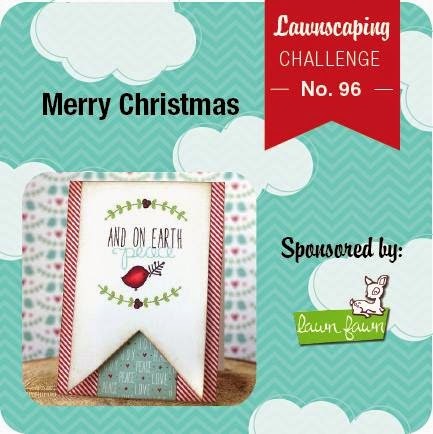 See you all right back here tomorrow for a new Lawnscaping Challenge!! I am back with another card for my Holiday Card Series - this is Card #7. 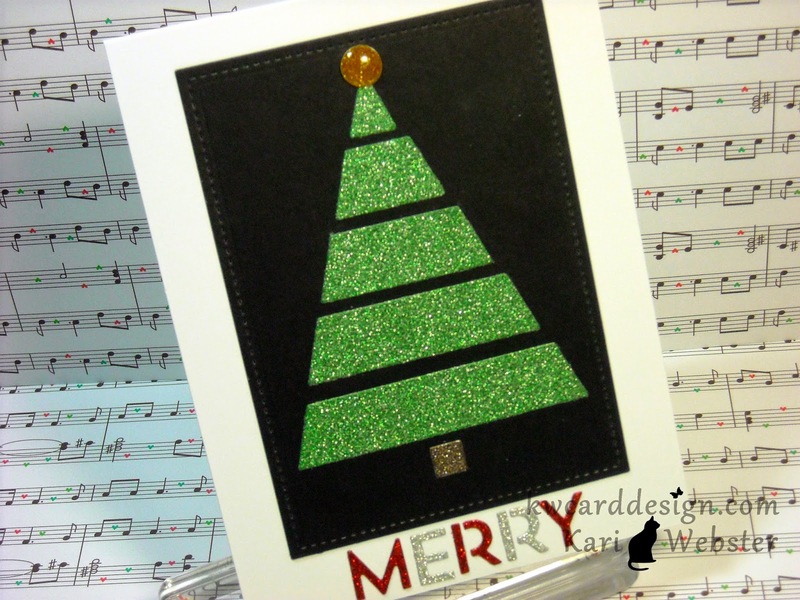 I used MFT's Christmas Tree Cut Out die set. I think this die set is so cute, and you can get so many looks out of it, it would be a really fun shaker card as well I think! To see how I put this one together, I've got the video tutorial below. And, if you are interested in any one the supplies I used - I linked as much as I could below as well. The Holiday Season is here!! Hi everyone!! These last few months of the year are flying by, and the holiday season is in full swing!! The Facebook Inspiration Team always want to provide you with extra inspiration for your holiday cards! 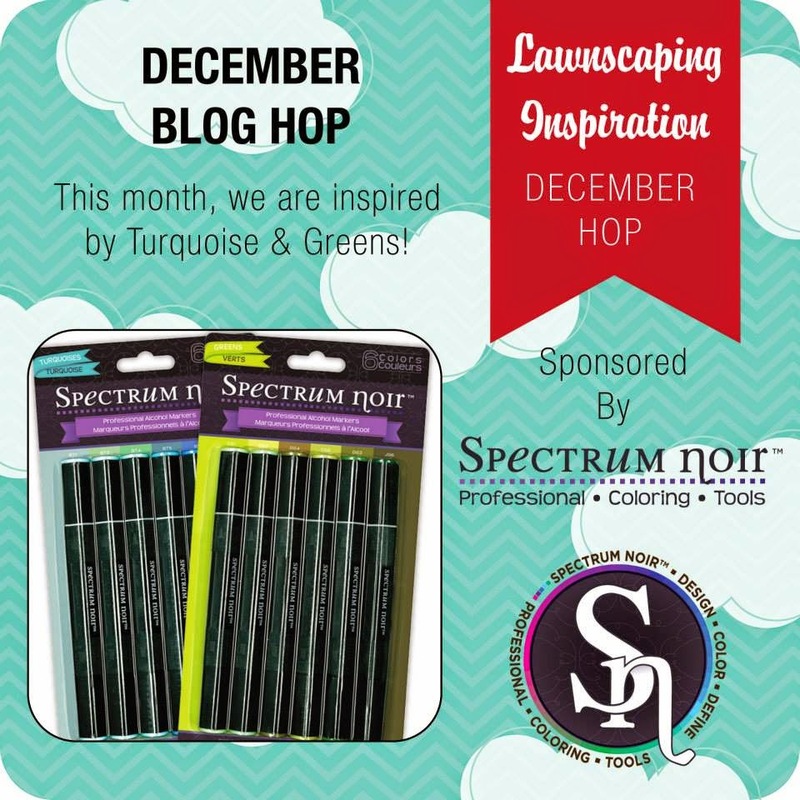 This blog hop is sponsored by Spectrum Noir, and they will be giving a lucky commentor a set of their awesome markers!! This month we are inspired by Grays and Blues. You should have found your way to my by the talented Isha! For my card this month, I decided to make a shaker! I usually don't make a whole lot of these - but I need to make more so I can get better at making them. I used Critters in the Snow for my seal. I stamped him down onto some white card stock, and used my cool grays to color him in. I cut several panels for my shaker. To make the frame, I used the two largest Large Stitched Rectangles Stackables dies, and for the inside piece I used the inside portion of the frame I created. I also used the largest frame to die cut a piece of acetate for my window. 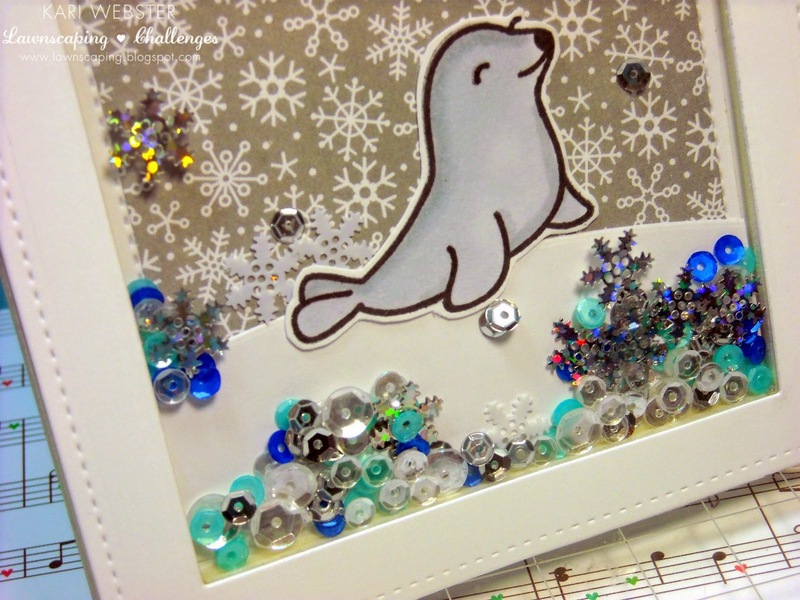 The snowflake pattern paper comes from the Frosty Friends 6x6 pad from DoodleBug. 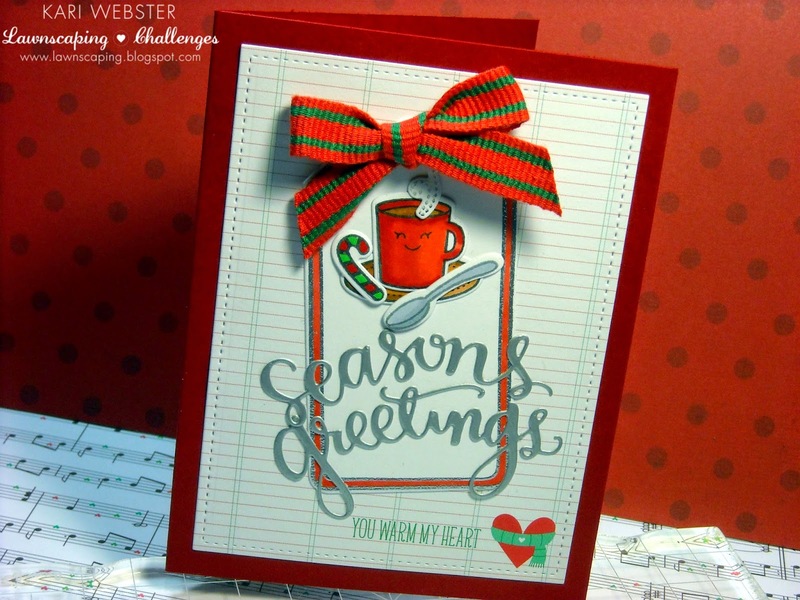 For my sentiment - I used the 'Warm Wishes' greeting from Love You A Latte from Lawn Fawn. I stamped it down onto my pattern paper using Memento Luxe Pigment Ink in Danube Blue and I embossed it with clear embossing powder. For my shaker elements I used a few colors of sequins from Pretty Pink Posh as well as the snowflake sequins from American Crafts. Be sure to leave a comment for your chance to win some awesome Spectrum Noir products! Your next stop is Lenny!! Thanks for stopping by and have fun on the rest of the hop! Hello everyone! I am sharing card #5 with all of you in my HCS for 2014. I broke out a new stamp set from WPlus9 that I recently purchased a few weeks back, and decided to ink it up. This card is one that can be easily duplicated. I love how bright it is! 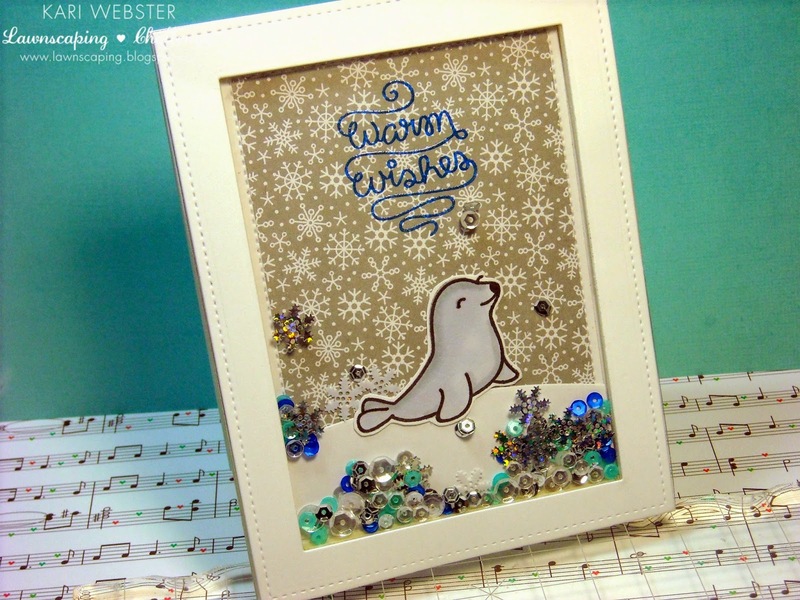 I simply die cut two pieces of card stock using the Avery Elle Finished Frames. I used my favorite white PTI white card sock and the other green card stock is from SU! Lucky Limeade. I am not sure if this card stock is still available, but something similar is PTI Green Leaf card stock. I then stamped my string of lights on my white panel using Memento Tuxedo Black ink, and then used Hero Arts Mid Tone Shadow Ink in Red Royal, Lemon Yellow, Green Hills, Orange Soda, and the blue is Audrey Blue ink from Simon Says Stamp. For the ends of the lights I inked it up with Gray Flannel Memento Ink. 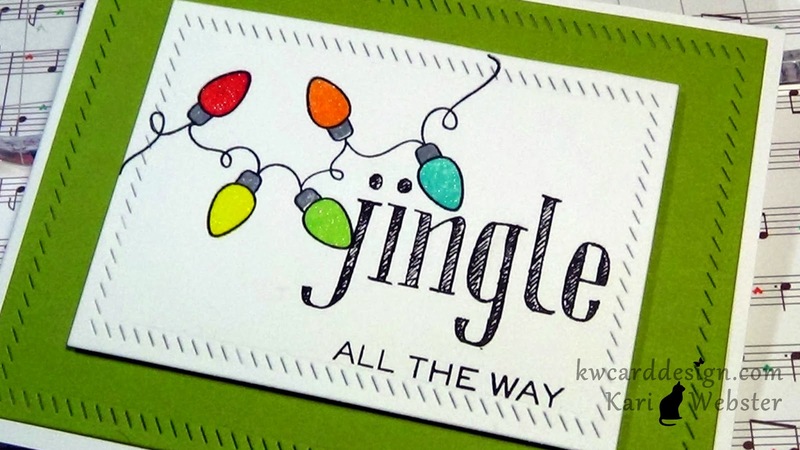 For my sentiment I decided on the 'Jingle All The Way' and I inked it up with VersaFine Onyx Black ink - great for sentiments. I then put my card all together. I pop up the white panel with foam adhesive, and adhered that to my Lucky Limeade piece and then adhered that to my white card base. I then added some Wink of Stella to my lights for some shimmer. Of course I have a video tutorial showing you how I put it all together. For all the supplies used - I've linked them below for you. Thanks for stopping in, and I hope you've enjoyed this series from me so far! !